What is better than locking your playoff spot? Getting your puppy into the the Player Team Of The Week obviously. Muppetillo must have had hell of week as he was able to accomplish 2 in 1 and confirmed his playoff participation and got his werewolf into the TOP5 in this leaderboard in a single match. Plus this was one of the hardest and most competetive weeks to get your players featured. While 20 fantasy points would be enough to win this most of the time, this week it was not enough to get on the list. 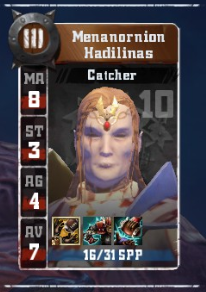 El Padrecito with his Mighty Blow, Piling On and Jump up is a natural predator to Lizards and he showed that in the week 12 match where he knocked out 4 and injured another 4 in 14 blocks and 13 armor breaks. The 1 surf was just showing off at that point. The damage to poor Hindus team was enough to decide him to rerol after the game. 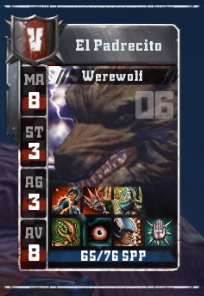 Disclaimer: Looking at the werewolfs name I at first wanted to make "Despacito" song about him but then I thought better of it. It was close though, so consider yourself lucky. While Muppetillo put up a fight for playoff spot, Wrekd was out of race but somehow forgot to stop running. He was able to get 2 of his players in this list and first of them is Catcher Verwarthil Undoos tres, cuatro, cinco, cinco, seis. Give it to me baby, uh huh, uh huh. Errr, where was I?. Right. Player Team Of The Week. Most of the time the players featured here are players with interesting skills. This Wrestle and Dodge Catcher in exception but the lack of skills moved him from position 5 to position 4. Looking at what he has done in the match I realized this is one of the system exploiting types. He made 3 passes and 5 catches. Then he tried to fly under my radar and threw 2 random blocks, breaking armor and knocking out the opponent as result. It is questionable if the team will continue to play in the next season, as they have not rolled anything interesting so far, and the team did not perform to the coach expectations. If they wont they at least finished with a style. MrShady seems to copy his previous season, this time swapping Skaven for Kislev. After disastrous start where he niggled the bear in, I believe, the very first match, he went from one loss to another with some random wins, only to recover and finish his season with 2 wins and a draw. Week 12 win saw 2 of his players make TOP 3 Players Team Of The Week. Wrath found himself on the 3rd place. 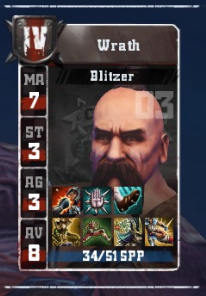 As primary blitzer he made 13 blocks and broke the armor 6 times. Out of the 6 times there was 1 knockout, 1 casualty and 1 dead Khemri player. He as well was on the receiving end of half of the 4 passes the team made in the match and scored 2 of 3 touchdowns. Finally "Fear the Leaper" became reality. Menanornion is 2nd of Wrekd players this week. And same as his mate he is not any special build. Wrestle and Strip Ball destine him to be the team dedicated sacker but, so far he lacks the X factor. It is therefore astounding what he and his teammate delivered in week 12. The team made amazing 9 passes and Menanornion was crucial part in 7 of them. 2 times on the sending and 5 times on the receiving side. He and Verwarthil must have been farmers in the previous life. Farming those SPPs to the limits. Or maybe they thought they are in One minute league and have a gimmick of passing ball every turn they have it in their hands. 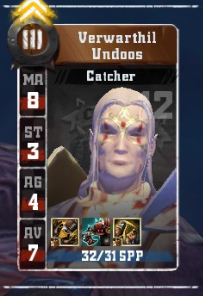 Making 1 block, with 1 armor break and 1 knockout and then scoring 1 touchdown shoot this guy up to the TOP player of the game and the 2nd best player of week 12. Hats off considering the lack of skills. 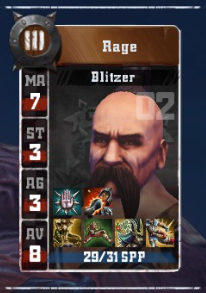 Rage is a twin with Wrath apparently and they had a family contest in their week 12 match. And Rage won it by the skin of his teeth, despite being the younger one. While his brother got 22 fantasy points, Rage pulled off nice 23 points. While there was occasional Kislev player in the Player Team Of The Week, 2 of them at the same time and from the same team is the first occurence ever. While Rage was bit slower when it came to blocking, doing only 8 blocks, he had better armor breaking rate, breaking the armor 5 times. He became more successfull in the removal area too and the 5 armor breaks resulted in 1 knockout, 2 casualties and 1 murder. And while he scored only 1 touchdown he made up for it by surfing one players. And was on the receiving end of the other half of the 4 passes. Their parents would be proud seeing how equaly they shared their success. Thank you everyone for enduring my prepubertal and brute writing this season. I was asked if I am on drugs while writing this and I must admit there was little bit of alcohol involved every now and then. It was nice experience (mostly the drinking part) and from next season I will likely move on to something else. So Player Team Of The Week is for grabs if you are interested. As well there is not going to be Week 13 as who cares about week 13 games when there is a overload of playoff games. So enjoy the playoffs and hopefully see you everyone return for season 10.